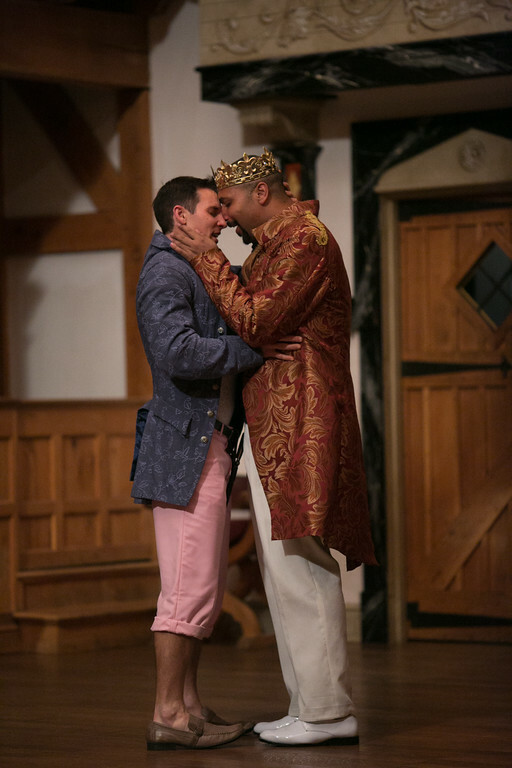 Patrick Midgley and René Thornton, Jr. in EDWARD II. Photo by LINDSEY WALTERS. 2014. 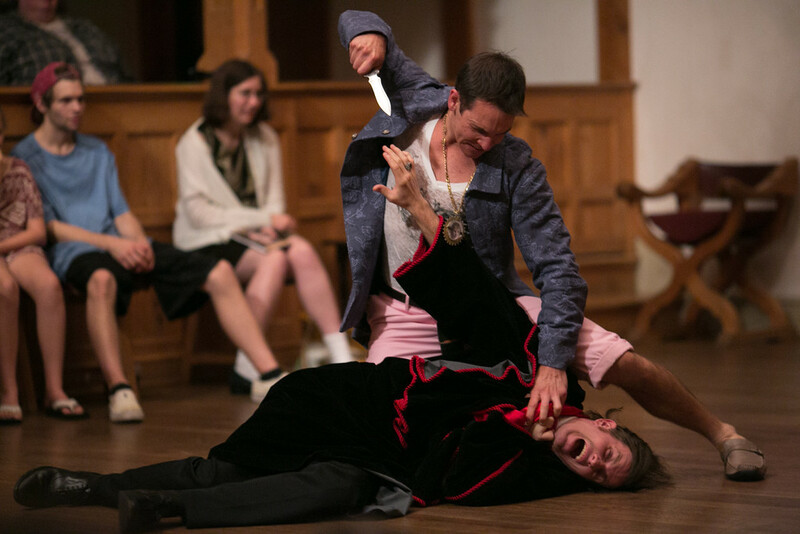 Patrick Midgley and Chris Johnston in EDWARD II. Photo by LINDSEY WALTERS. 2014. 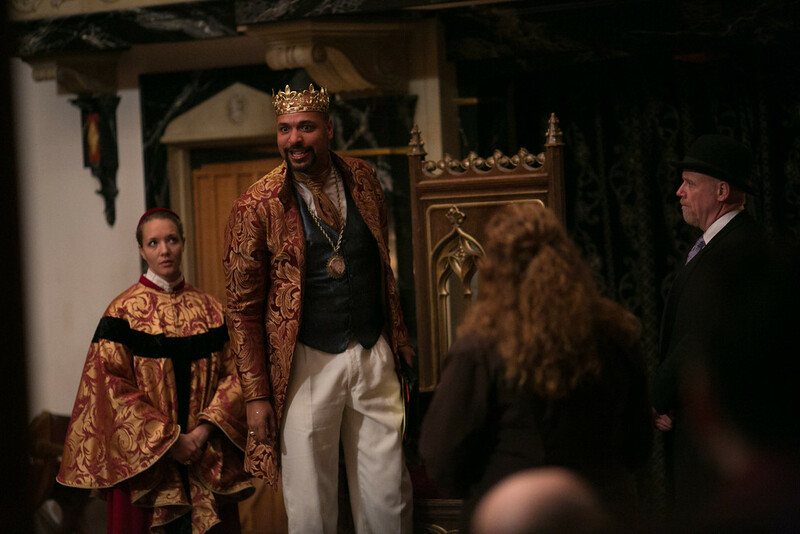 Sara Hymes, René Thornton, Jr., Allison Glenzer, and James Keegan in EDWARD II. Photo by LINDSEY WALTERS. 2014. 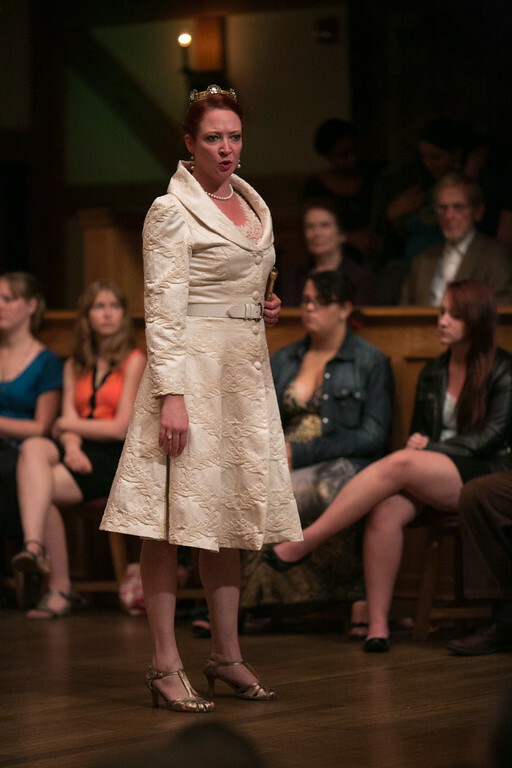 Sarah Fallon in EDWARD II. Photo by LINDSEY WALTERS. 2014. 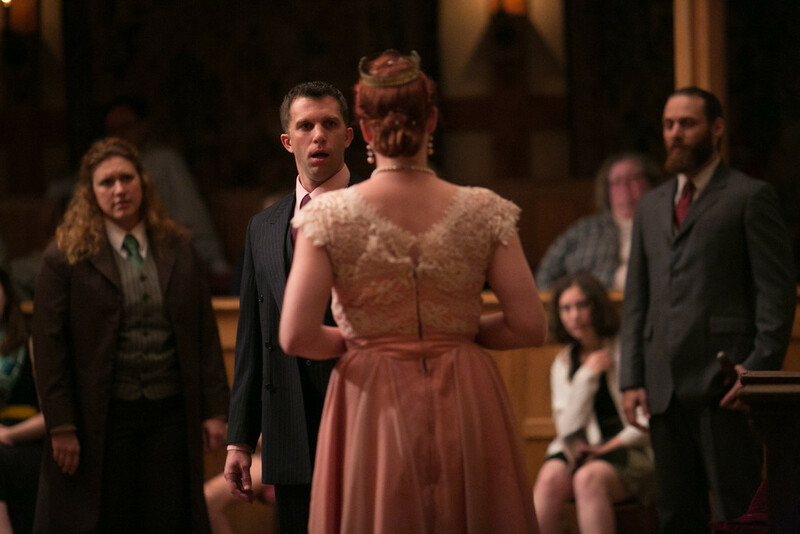 Allison Glenzer, Gregory Jon Phelps, Sarah Fallon, and Jonathan Holtzman in EDWARD II. Photo by LINDSEY WALTERS. 2014. 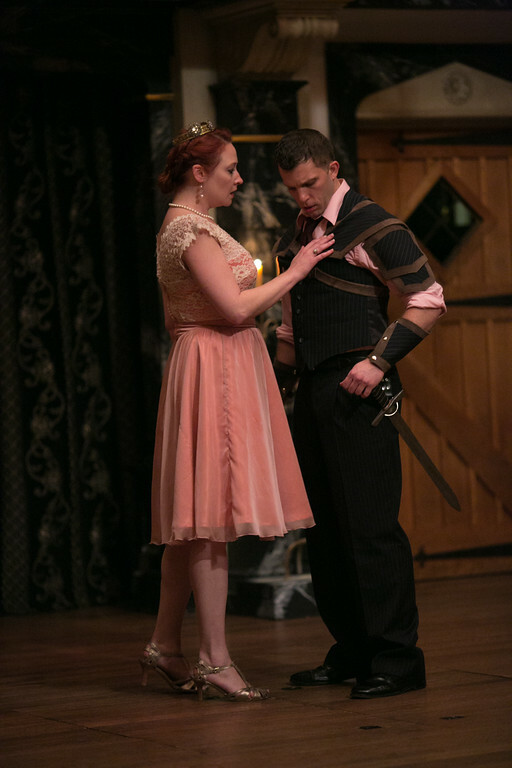 Sarah Fallon and Gregory Jon Phelps in EDWARD II. Photo by LINDSEY WALTERS. 2014. The cast of EDWARD II. Photo by LINDSEY WALTERS. 2014. 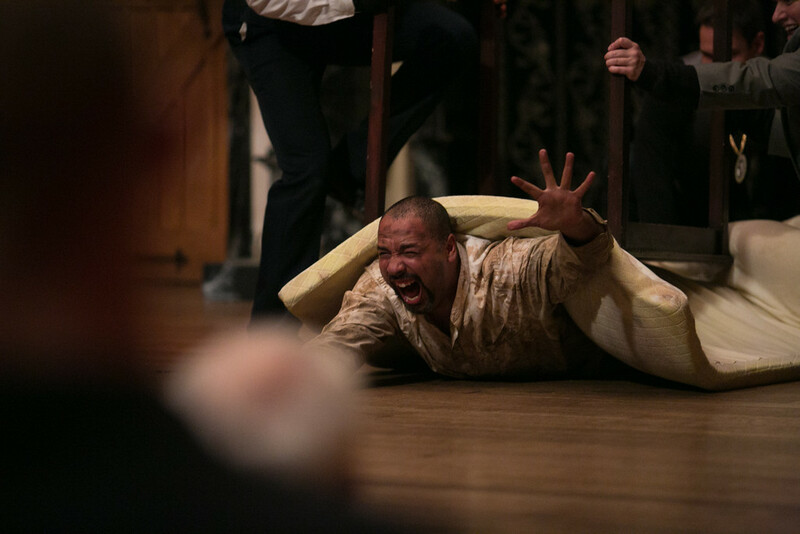 René Thornton, Jr. in EDWARD II. Photo by LINDSEY WALTERS. 2014. Gaveston greets the King, who names him Lord Chamberlain, Chief Secretary to the State, and Earl of Cornwall. Edward also strips the Bishop of Coventry of his title and lands, awarding them to Gaveston. Lancaster, Warwick, and Mortimer discuss Gaveston’s meteoric rise and plot his downfall. The Archbishop of Canterbury joins the plan, but, along with Edward’s queen, Isabella, urges them not to raise arms.  The noblemen draw up a document exiling Gaveston and force Edward to sign it. Edward and Gaveston share an emotional farewell. Queen Isabella decides it would be easier to keep an eye on Gaveston in England and so repeals his banishment, much to Edward’s happiness. Edward betrothes Gaveston to his cousin, Margaret, heir to the Earl of Gloucester. Edward obsesses over Gaveston during his absence from court, ignoring issues of state and frustrating his lords, who threaten a rebellion. The King’s brother, Kent, joins the lords in their fight against the King; they pursue Edward and Gaveston, who flee. The lords capture Gaveston, then make a deal with Pembroke to release him into the King’s custody. Warwick re-captures him from royal protection, an act of treason. Edward attempts to manage the rebellion, sending Queen Isabella and their son to Normandy to reclaim the lands seized by the King of France. Edward receives news that Gaveston has been killed at the hands of Warwick and his men. 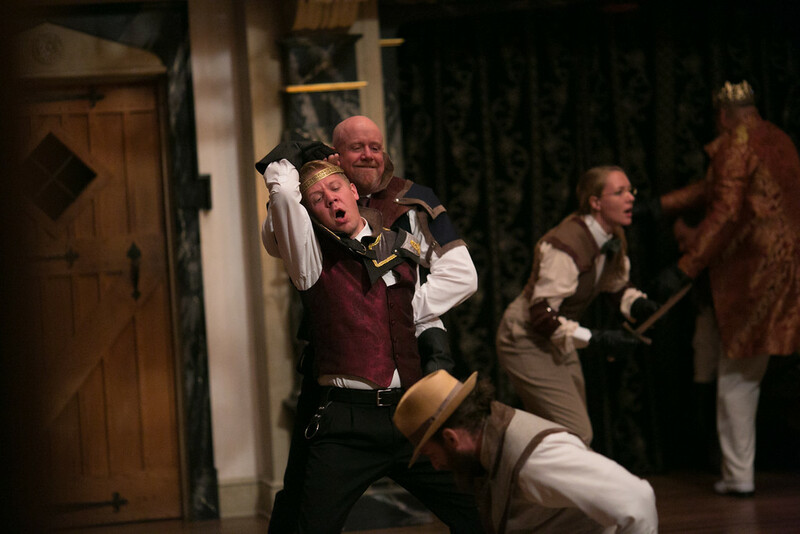 Battles, treachery, disguises, black humor, and fireplace implements ensue. Christopher Marlowe and William Shakespeare were both born in 1564 and eventually became two of the most important playwrights in the golden age of English literature. That sounds lofty. They were also just amazing writers who wrote great plays. Marlowe was the son of a cobbler and Shakespeare was the son of a glover. Marlowe received scholarships that got him a university education; and on his way to becoming a clergyman (part of his scholarship requirements he never fulfilled) he wrote at least seven plays, possibly became a government spy, and died a mysterious and violent death at age 29. Shakespeare did no go to university; he became an actor, a playwright of at least thirty-something plays, and eventually a shareholder in an acting company (sponsored by King James) before retiring to his hometown and dying at the age of 52. Marlowe rocked the theatrical world with his early play, Tamburlaine the Great, which was a huge success and seemingly had a big impact on Shakespeare’s first tetralogy of history plays – Henry VI, Parts 1-3 plus Richard III. Marlowe was the first Elizabethan to make a Jewish character the central figure in a play – The Jew of Malta – which influence Shakespeare in creating his Merchant of Venice. Marlowe made it popular to write plays in blank verse (iambic pentameter); Shakespeare picked up on this style and made it even more mainstream throughout his longer career. 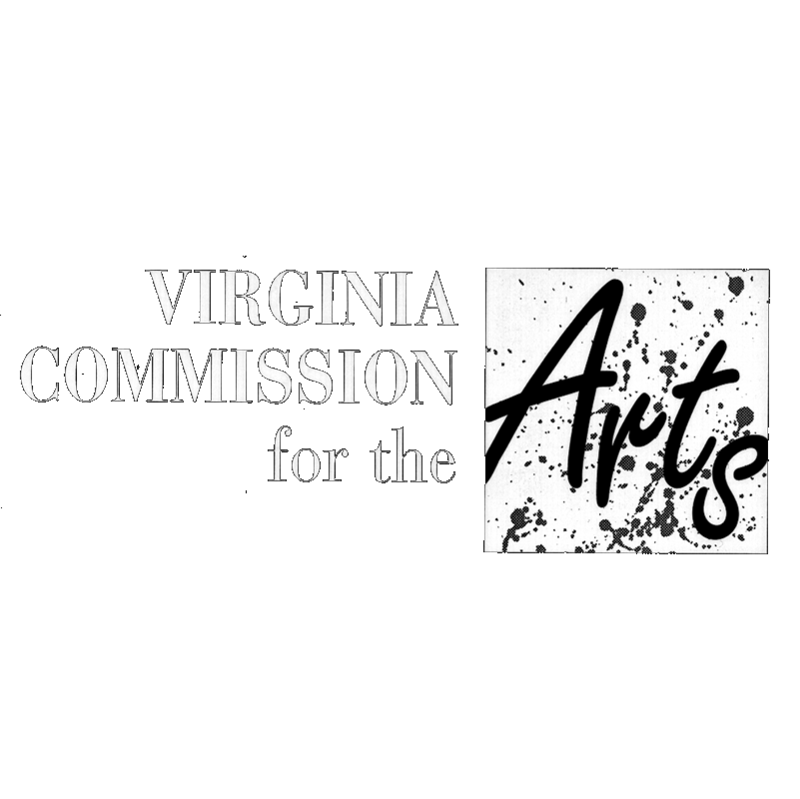 These two playwrights were at the center of a theatrical and cultural revolution in ways that were similar to The Beatles and The Rolling Stones being in the middle of a musical and cultural revolution. Marlowe and Shakespeare were rock stars of their time. Edward II is, perhaps, the last play that Marlowe penned. His other plays: Dido, Queen of Carthage; Tamburlaine the Great (Part 1 and Part 2); Doctor Faustus; The Jew of Malta; The Massacre at Paris take place in locales (sometimes exotic) away from English shores; but Edward II tackles English politics head-on and Marlowe most likely used Holinshed’s Chronicles as its chief source material, like Shakespeare did for his histories and some of his tragedies. The King at the center of E2 is as complex and fascinating as any title character from Shakespeare’s canon. Some would say that Marlowe created King Edward II in the vein of “flawed kings” like Shakespeare’s King Henry VI, King Richard II, and King John. I think each of those kings make juicy theatre characters because each one has his own tasty set of human foibles that can make them delicious to watch and support. If we do our jobs well in creating this production: some of you will root for Edward, in spite of some of his questionable decisions; some of you will bond more with Queen Isabella as she yearns to have her husband by her side and maneuvers politically to protect her son’s right to the throne; some of you will throw your support behind the nobles who want to rid the King and their kingdom of the meddlesome presence of the King’s favorite courtier, Gaveston; and some of you will want all of the above. 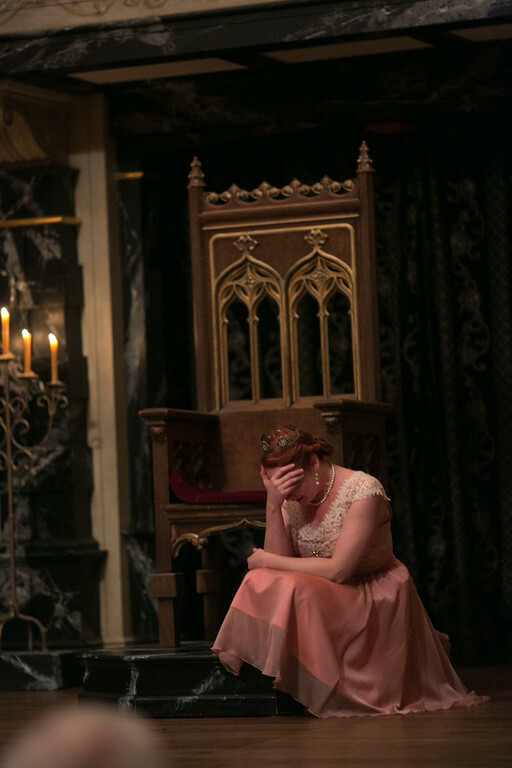 Our production will not damn King Edward any more than history and Marlowe do: we will not add orgies and unbridled Caligula-esque excess to further stack the deck against the King and his divine right to rule. We will show clearly what Marlowe gives us: a King on the brink of losing the support of his nobles because of his own actions, preoccupations, and love. We will show a King fighting to keep his kingdom and love whom he loves. We will ride the dangerous edge that Marlowe gives us by showing a common man favored by a King who simultaneously loves the King and desires to make the most of his advancement. 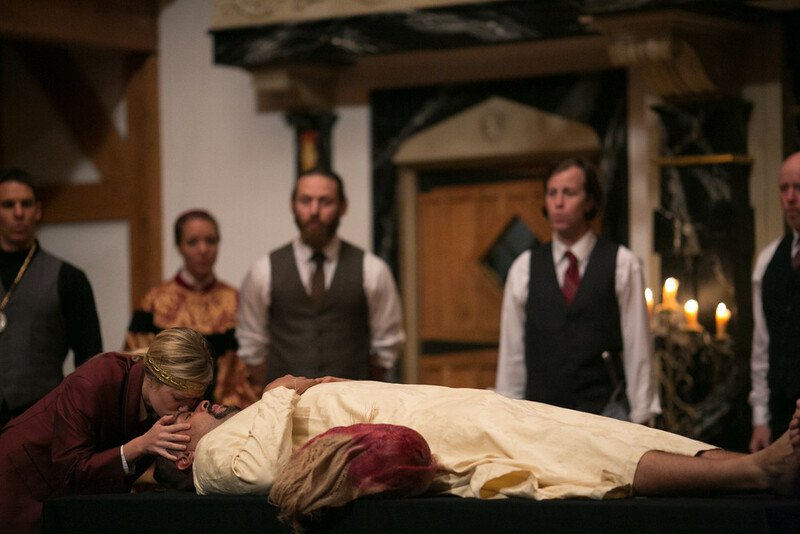 We will craft a production that serves up Marlowe’s many flavors of love and allows the audience to feast on their favorite flavors.